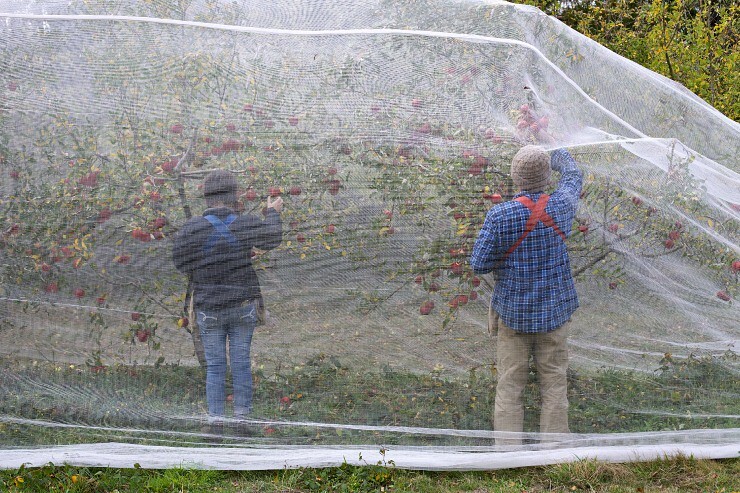 On Sunday we picked the last of the apples and pulled the nets off the trees. 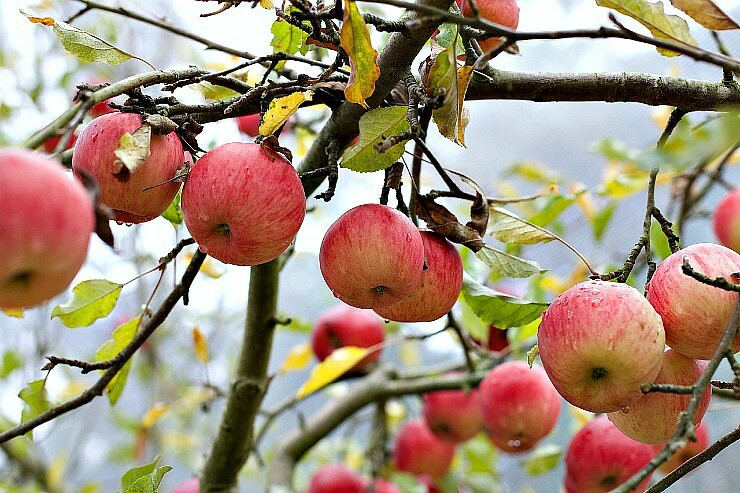 It's been an incredible season, possibly our best ever and although I do feel sad at the thought that it will be so many months before I pick another juicy ripe apple from a tree, I feel happy and grateful for the season that was. 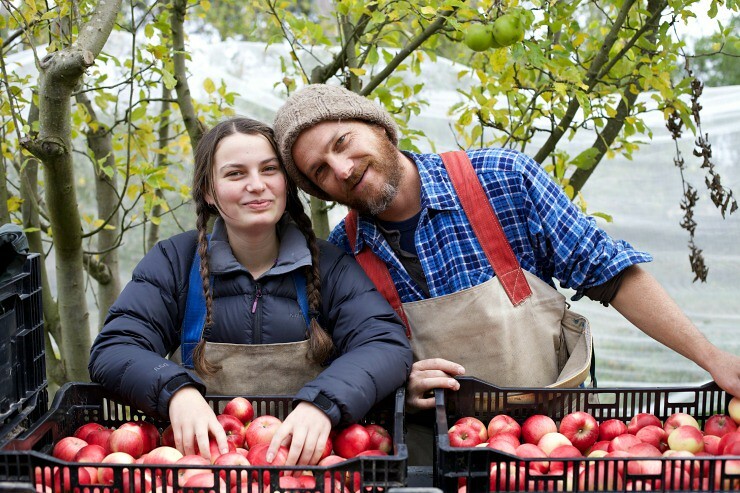 Our orchards are made up of 40 varieties of heritage apples to spread out the blossom and the harvest - so we picked and we picked this year all the way from January through to late May. From the sweetest all the way through to the ones that make you wince with sour. From the ones that hold their shape when cooked through to the ones that completely disintegrate into mush. 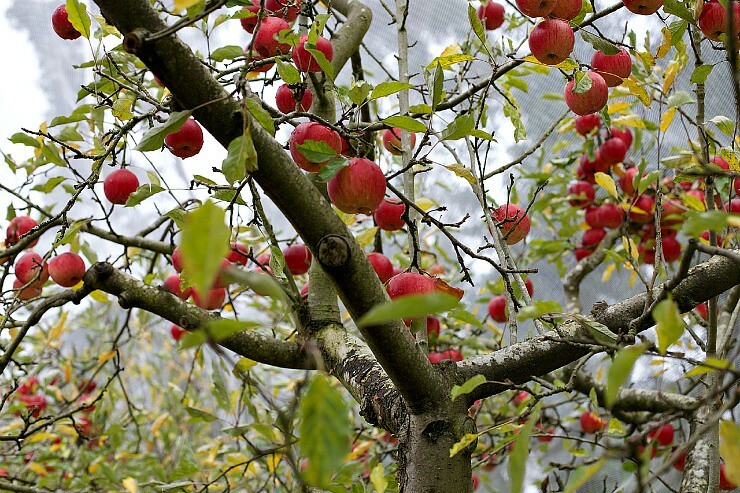 From the old faves like Granny Smiths and Jonathans all the way through to the interesting Mutzus and the Peasgood's Nonesuch and the Esopus Spitzenbergs. 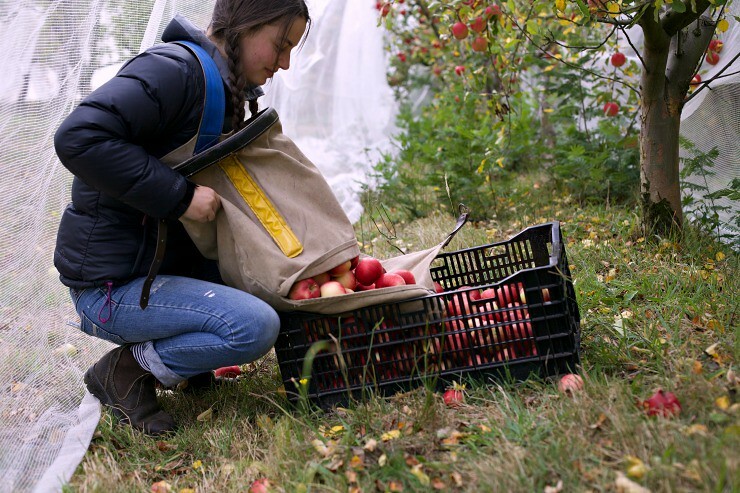 And although we do wonder if the bio-dynamics and the nets made the season so great, we're most thankful of Mother Nature and the rain and the sunshine and the bees. 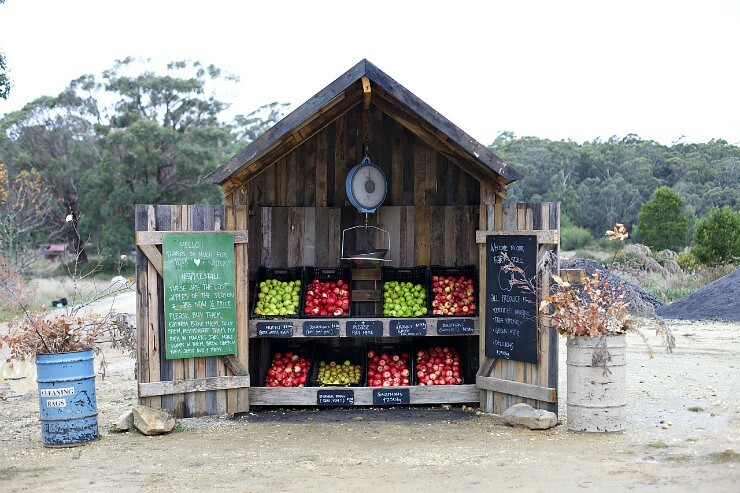 And the farm stall. How we love that stall. 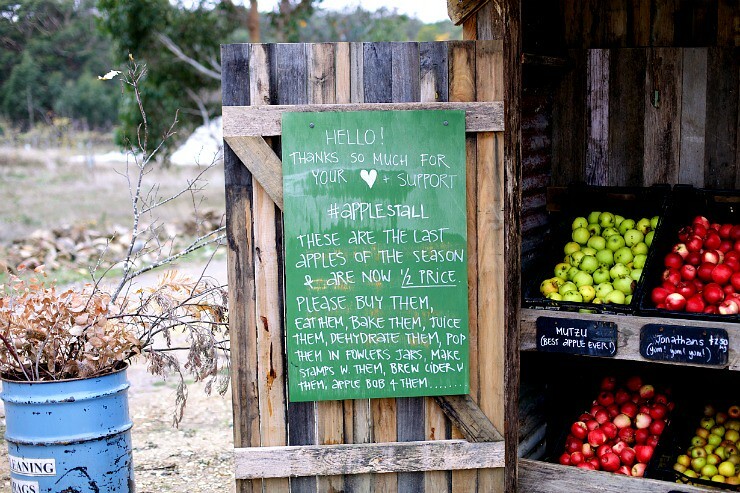 Opening her up in the morning, picking apples and filling the crates, writing cute notes on the blackboards for our customers, our gorgeous customers, and the thought that our apples are being munched and crunched in homes and lunch boxes all around the area. 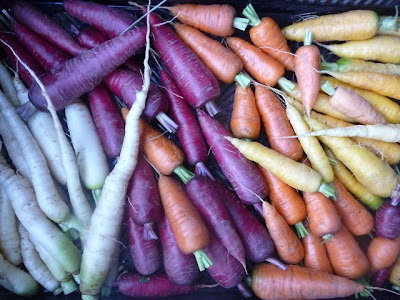 So to finish on a high and to thank you for your love and support, we have dropped the price to $2.50 a kilo from now until we run out. Which will be pretty soon I think. 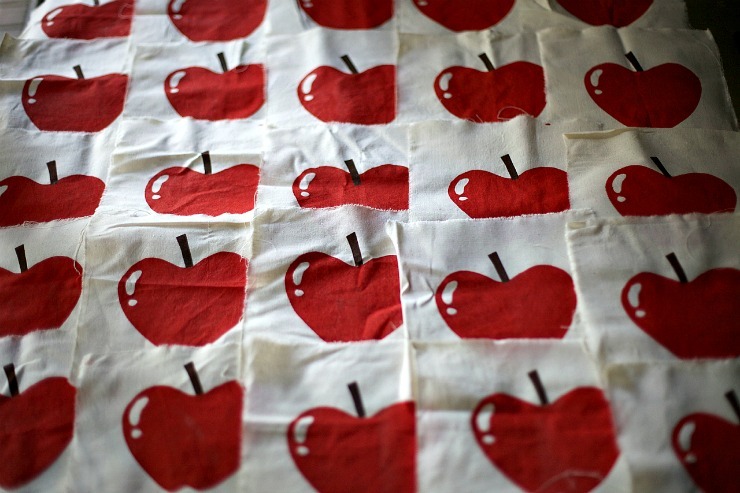 And tell me - what's your fave variety of apple and what's your fave way to eat them? And now for the crafty bits. 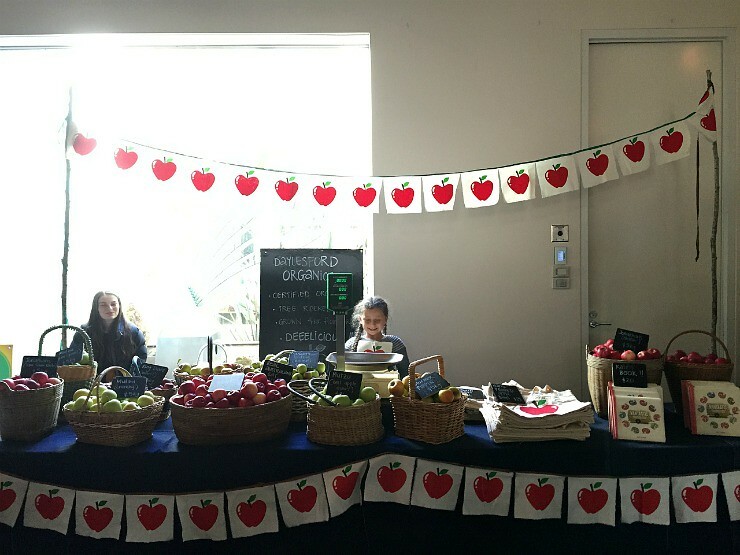 to decorate our stall at The Lake House produce day last month. 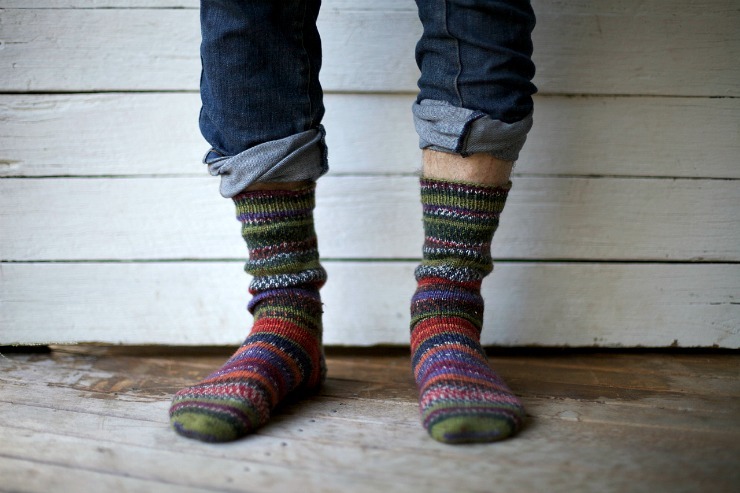 The skein of yarn is split into two 50 gram bits so you know when to stop winding one and start winding the next and then you can't help but knit two identical twin socks. The colours and patterns change so often which made them interesting and fun. Somehow, I have no idea how, the yarn is dyed into those colours and patterns which means you get the cool designs without all the ends to darn in. Apart from the giving or wearing, the best part of finishing a pair of socks is adding a new colour into my scrappy sock blanket. It's still not very big, but I'm really loving it. As far as I can work out I have one button band, the neckband and the seaming to do and then I'm done. I still have no idea if it will fit me but it's getting to that stage where I'll soon find out. I'm knitting Amanda in Tonofwool which I am LOVING!! It had beautiful stitch definition, it is super soft, it's Australian and I have a few samples that I'll be giving away soon - so watch this space. 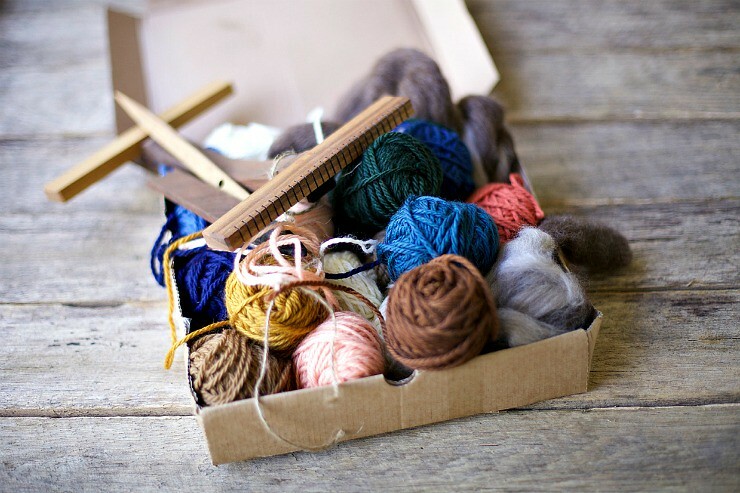 Then there's the weaving kit that farmer Bren and the girls bought me a week before mother's day. 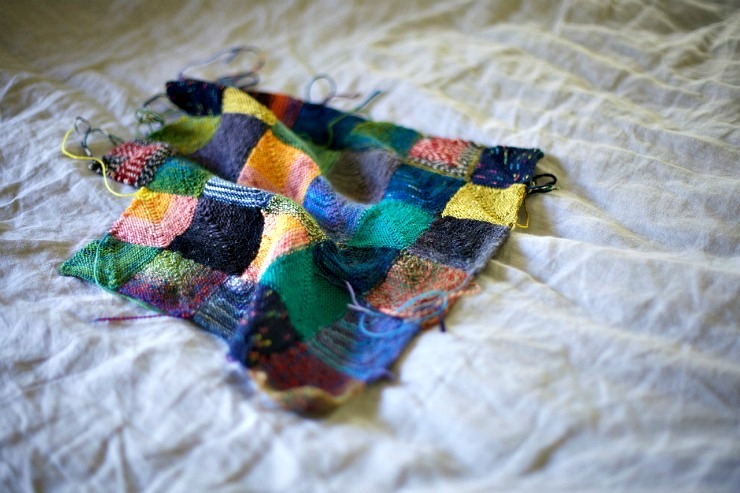 I am busting to have a go but trying my hardest to wait til I am wearing my new cardigan. Which brings us to the sweet Tea Mouse. 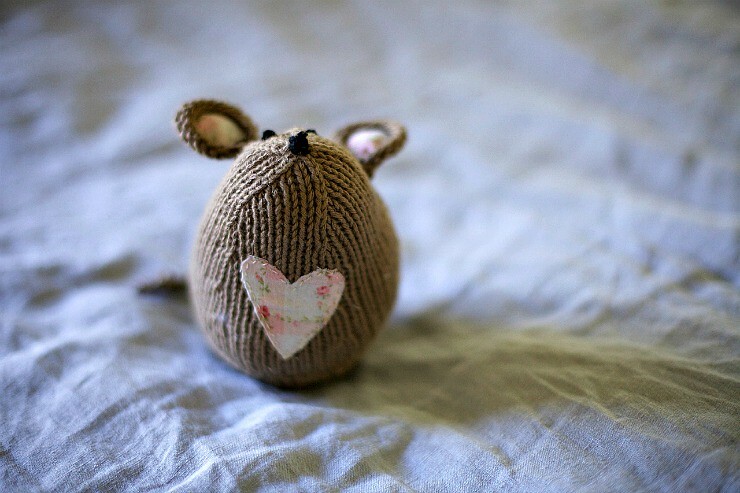 Tea Mouse is the cutest softie pattern designed and written by lovely Sarah from Chantille Fleur. In Sarah's own words - The Chantille Fleur Tea Mouse has darling little ears with fabric lining, a matching love heart on the front and even a little knitted tail. She's a sweet little character with a lovely black nose which she just loves to point in the air. The Tea Mouse is a delight to look at and to create. Sarah posted me the kit which meant all I had to do was find the right sized needles and get to work. The pattern was easy to follow and came together quite quickly. I had thought it might make a sweet gift for a new baby but it keeps disappearing into Miss Pepper's bedroom. 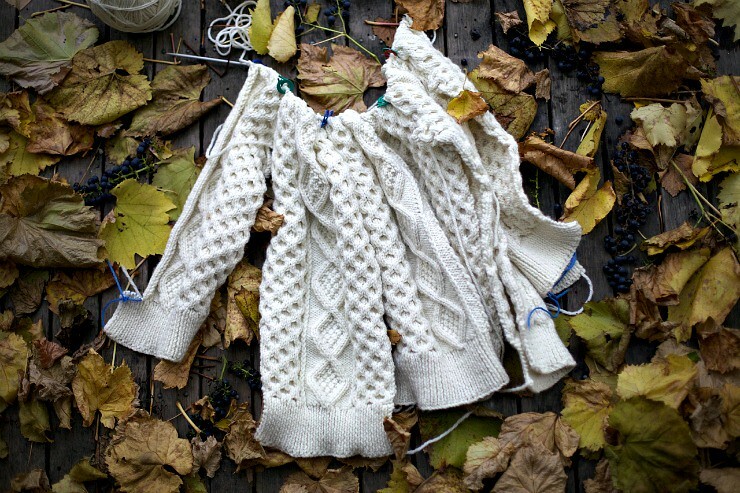 Looks like I'll just have to knit up another one. Or two. Sarah has very kindly offered to send a Tea Mouse kit to one of you guys, (Australian addresses only, sorry). Tell me in the comments who you would give your little Tea Mouse to and I'll pick a winner on the weekend. Until then check out the knitting kits here. The Tea Mouse Ravelry page here. Chantille Fleur on instagram here. OK, that's me all craft caught up, how about you? What're you making at the moment? I guess the main problem with blogging so infrequently is that I'm always catching up. And when I'm catching up I often forget some of the details, I sometimes don't have the relevant material with me anymore and I always feel like there's so much to get through that I don't know where to start. So I guess this is a kind of warning that the weather forecast for this week is grim so I might finally find myself with a bit more inside/computer time and a couple of catch up posts might be on the cards. The first is a book report. Or bookS as the case may be. 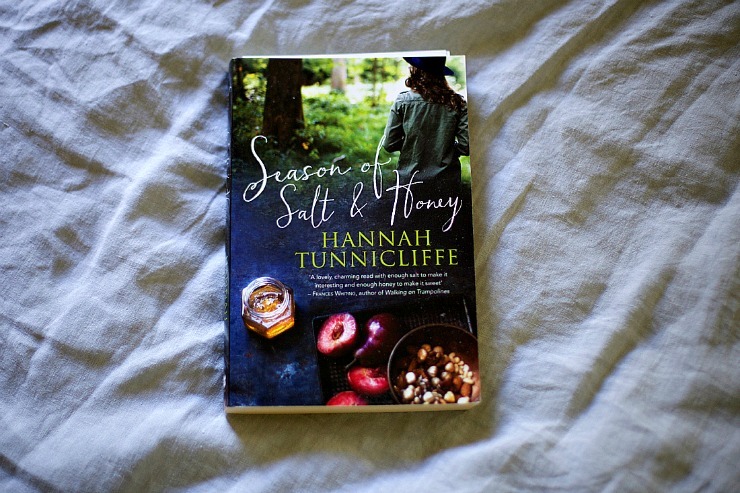 Season of Salt and Honey was written by fellow blogger and mother of two cute girls Hannah Tunnicliffe. In Hannah's own words - Seasons of Salt and Honey is the story of a young Italian-American woman escaping the tragic loss of her fiancé by retreating into the Washington coastal rain forest. I read it in a couple of nights, devouring all the relationships, the descriptions of grief and Hannah's gradual physical and emotional journey from a life that was safe and expected all the way through to one that she chose and fought for. The thing that makes this book so different for me was the traditional Sicilian recipes included within the chapters. Nine recipes that had me reading each word of their ingredients lists and methods as if they told an important part of the story. While I've seen loads of cooking scenes in movies, I'm not sure I ever have read them in a novel before and I loved the extra flavour it gave to the story. When Hannah wrote to me explaining that she was a friend of Beth's and had written this book and would love to send me a copy, she suggested I might like to cook a couple of the recipes in my review. While I haven't yet had the chance, I can certainly see her Nzuddi - Vinnies - roasted almond cookies, Spring risotto and Rosolio alle Erbe - sweet herb cordial/liqueur in my future. Season of Salt and Honey can be purchased online here. 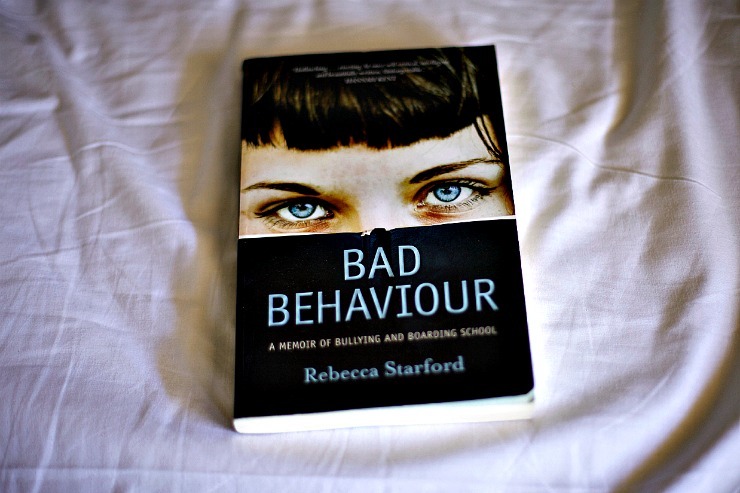 My sister Abby lent me Rebecca Starford's Bad Behaviour last week and I read it in about two days. I could not put it down. Bad Behaviour is the story of one woman's experience of life at the country campus of an exclusive Melbourne school. The book examines boarding school life and bullying and gives the author an opportunity to tell her own story of life before that year away and since. This book touched me on so many levels. Firstly, when I was about halfway through BB I clicked onto Facebook one night and found a gorgeous picture of a group of current students of that very same school, all heavily laden down with enormous matching blue backpacks on the top of a mountain somewhere in the Victorian high country. I sat searching those 15 or so faces for ages, looking for the characters in the book (even though it's been years since they hiked that trail), trying to work out who would be the leaders and the followers and imagining all sorts of other scenarios from the book. I guess that snapshot gave a reality to the book that could otherwise have been just another story. Secondly, BB took me all the way back to camps that I went on at school. The things we got up to, the popular girls, the cruel taunting that went on and the general day to day life. And lastly, a book about a 14 year old girl of course made me think of my 14 year old girl and some of the stuff that goes on with her friends and classmates. I'm sure BB ruffled a lot of feathers and upset a lot of people and I do feel awful about that. I'm not sure how I would feel if someone were to publish a book detailing the goings on of my year ten camp. However it is an interesting story and for all the reasons above - I couldn't put it down. 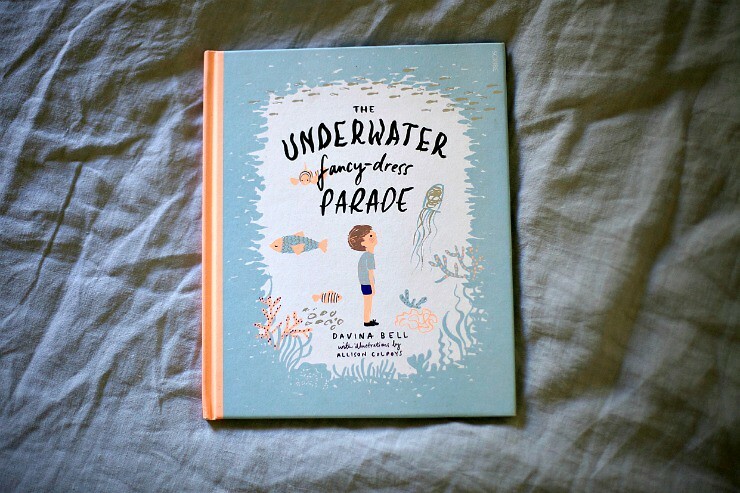 When Marika from Scribe publishing emailed me asking if we would like her to send us a copy of The Underwater Fancy-dress Parade, a new children's book, I originally thought I'd say no. My girls are all now well out of the picture book department and it didn't seem like it would be relevant. But then I read Marika's review and changed my mind. Marika wrote - It's a very sweet story of childhood shyness and fitting in - the message being that it's OK to be shy, and that it's not a character flaw to be fixed. 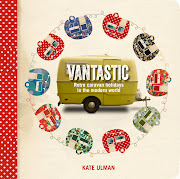 While stories of elves and fairies and horses are great, I've found that books aimed at young readers don't necessarily tackle the big life stuff and sometimes a picture book is just what you need to get the conversation started. This book certainly does just that. And did I mention that it's GORGEOUS!!! 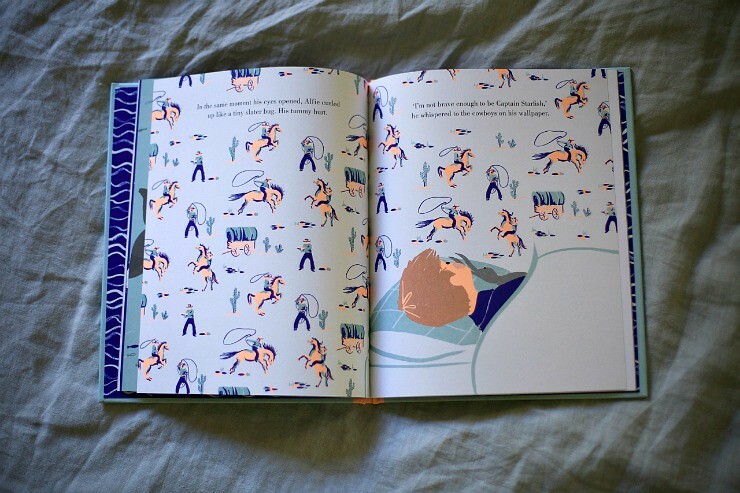 Allison Colpoys illustrated this book and Davina Bell wrote it. We've read it several times in our home, both together and alone. We've used it to discuss and understand situations we've found ourselves in and also some of our friends. I think we might donate our copy to our school library this afternoon so more kids can read it and discuss it. Here's a cute story of how the book came to be. 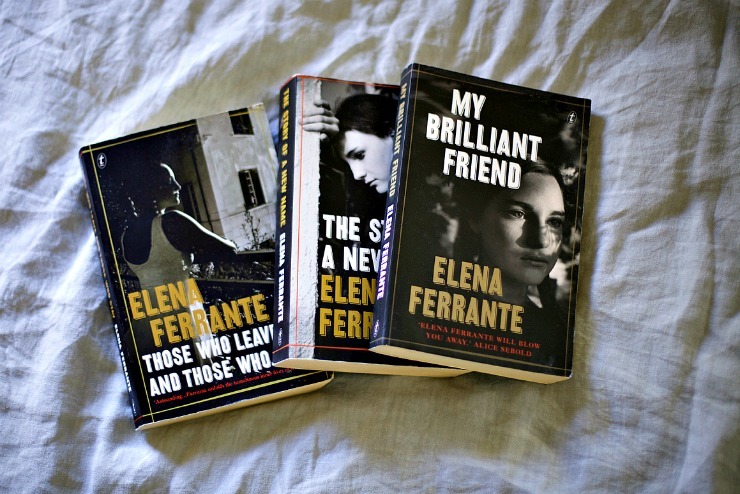 My sister Emily lent me the Ferrente novels a few weeks ago and told me I'd love them but before that I'd never even heard of them. My Mum said they are huge but I guess that shows how out of the literary circle I am. But nevertheless I loved them!! Loved them!! Three big, fat books that carry the story of two girl friends from childhood all the way into their womanhood. Their story is filled with descriptions of a neighbourhood, a community, of places, of times and politics, of family and of friendship. For me, the worst part of reading these books was coming to the end of the third book and feeling like I had to say goodbye to the main characters Elena and Lila. You can imagine my happiness when Emily told me there's a fourth and final book in the series coming out this October. Yay! Which brings me to Tracks by Robyn Davidson, which my sister Meg recommended to me and I am reading right now. And loving. No picture of the cover because I am reading it on my kindle. 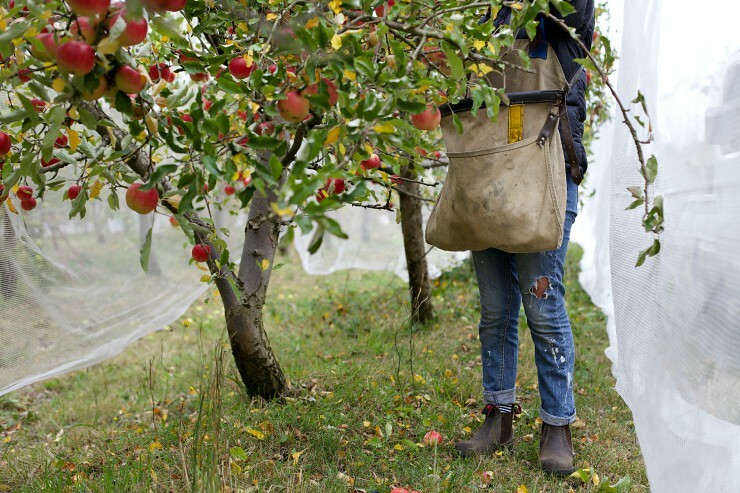 Hopefully I'll post soon about Pip's new book - Craft For The Soul - which Miss Indi has claimed and is adoring and Michelle's book - A Table In The Orchard - which farmer Bren is devouring hungrily. Phew, that's books all caught up, I'll try and do craft next I think. Or maybe an outside farm post if the weather cooperates. In the meantime - what are you reading? Please do not copy images or content from my blog without first asking permission or linking back here. Thanks.